Depending on where you are, stock of the GTX 1070 is plentiful, but prices vary. Here in the UK, the GTX 1070 can be had for £250, but this, interestingly, is exactly the same as the cheaper GTX 1660 Ti cards I’ve seen too. In the U.S, you’re looking at around $300 for a new GTX 1070 and a little less for the newer Turing card. This raises a fairly obvious question; Should you go for the tried and tested GTX 1070 or the new Turing-based GTX 1660 Ti? What should you do if you find a bargain GTX 1070 online? To find out, I’ve pitched both cards against each other in a range of titles from the latest 3D games such as Far Cry 5 and The Division 2, older but still tough-to-run titles such as Deus Ex: Mankind Divided, plus those that are fairly easy to run, but are popular with high refresh rate gamers that want super-high frame rates, such as World of Tanks. 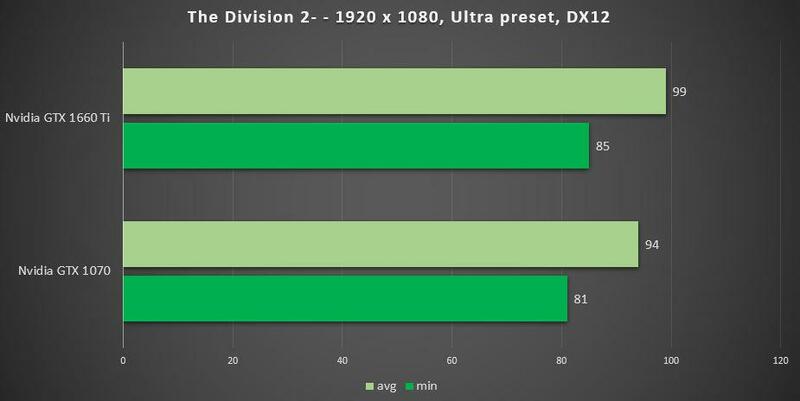 Nvidia RTX 2060 Versus AMD RX 590: Which Is The Mid-Range Graphics Card King? Nvidia GeForce GTX 1660 Review: A Worthy Successor To The GTX 1060? My test system includes an Intel Core i9-7900X, 32GB Corsair Vengeance RGB Pro 3,200MHz memory, an Asus ROG Strix X299 Gaming motherboard, a 500GB Samsung 960 Pro SSD, NZXT Kraken X42 cooler and Corsair RM850i PSU. I’m also using a fully up-to-date install of Windows 10 with all security patches including those for Spectre and Meltdown vulnerabilities. I’d like to thank Zotac for providing its GeForce GTX 1660 Ti Twin Fan graphics card. I used an MSI GeForce GTX 1070 AERO 8G for comparison. To start with let’s look at the recently-released The Division 2. I should mention that I haven’t had time to benchmark my full set of other mid-range cards in this game yet as I have previously with other titles, but today we’re just focusing on these two cards – I’ll add the rest in my next graphics card launch article. At 1080p, there really isn’t a lot in it, but if you had the choice of either card at the same price, the GTX 1660 Ti is the one to go for as it has a slight lead. 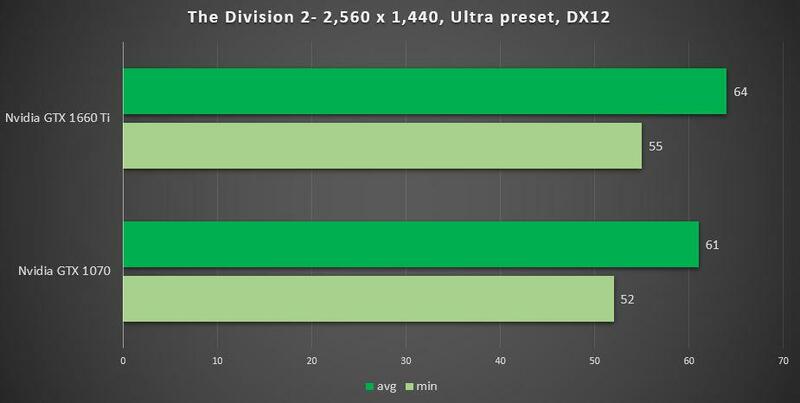 At 1440p it’s much the same – the newer card is your best bet with small leads on the average and minimum frame rates. 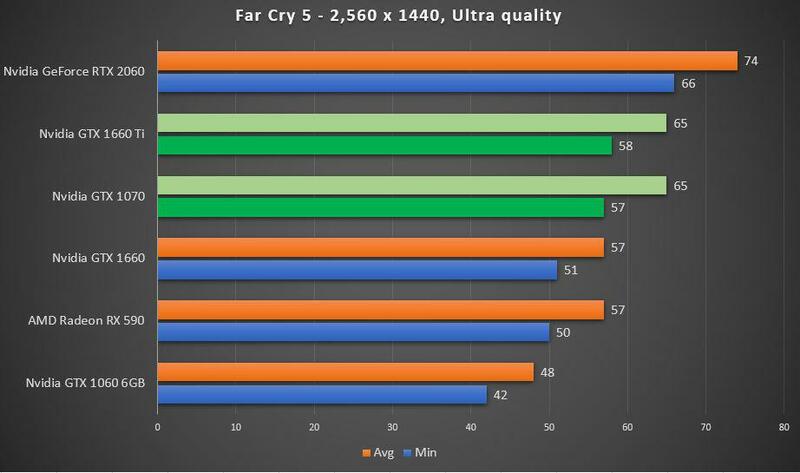 Not being a particularly tough customer for mid-range cards, Far Cry 5 saw both cards perform within a few frames per second of one another. Unless one card is significantly cheaper than the other, you may as well go for the newer and potentially more future-proof GTX 1660 Ti. 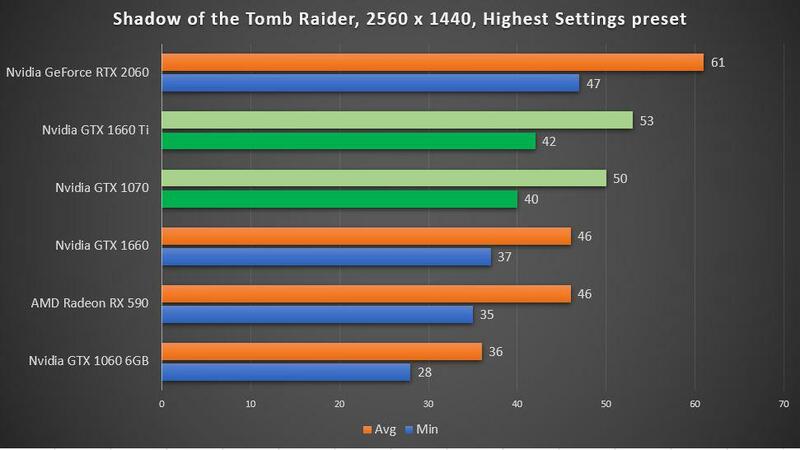 It’s a win for the new Turing card in Shadow of the Tomb Raider, with small leads over the GTX 1070 at both 1080p and 1440p. In fact, even the GTX 1660 is worth considering over the GTX 1070 here, with the more efficient Pascal architecture delivering decent bang per buck. 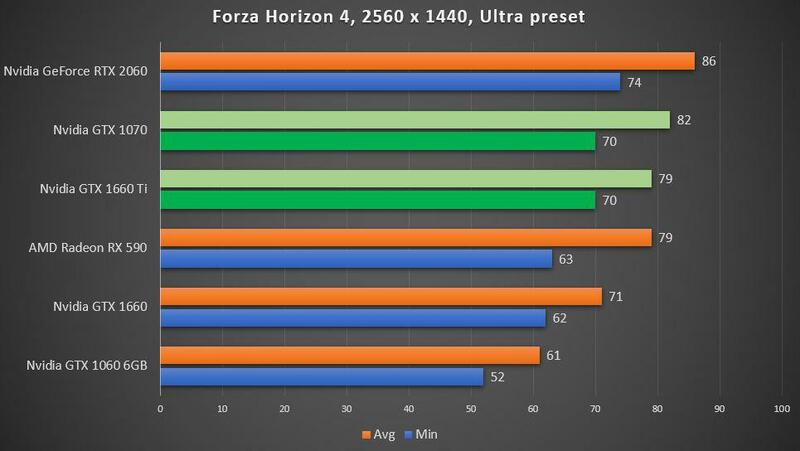 Forza has proved to be somewhat of a curveball in the benchmarks as it not only clearly favors AMD, but sees the GTX 1070 sit head and shoulders above the GTX 1660 Ti, at least at 1080p and less so at 1440p. In fact, the gap at 1080p was much larger for all cards – not just between these two. Somewhat inconclusive overall, but if you’re a 1080p monitor owner and a Forza fan, the older card is certainly tempting. Using the game’s enCore benchmark that utilizes the recently updated graphics engine, this is still an easy game to play even with low-end graphics cards. However, if you’re using a high refresh rate monitor, you’ll likely need to be maximizing those rate rates. 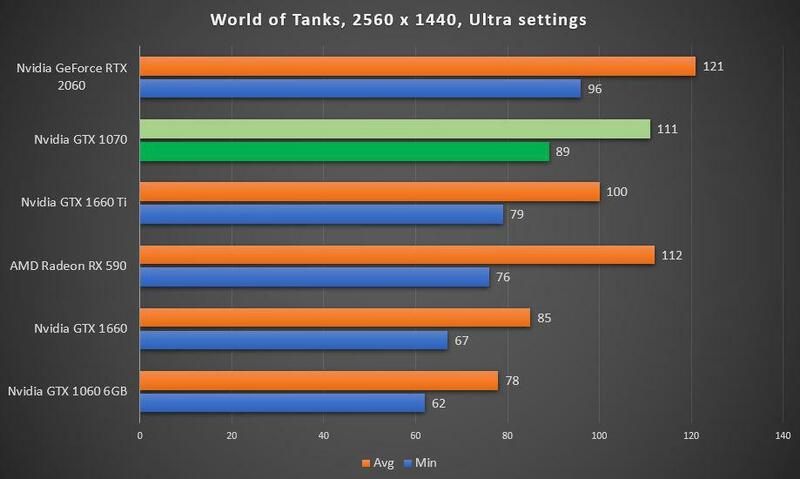 There’s little point testing 1,920 x 1,080 here as even a mid-range graphics card can handle a good 100fps, but 2,560 x 1,440 is more of a challenge if you’re trying to make the most of a 144Hz monitor for example. 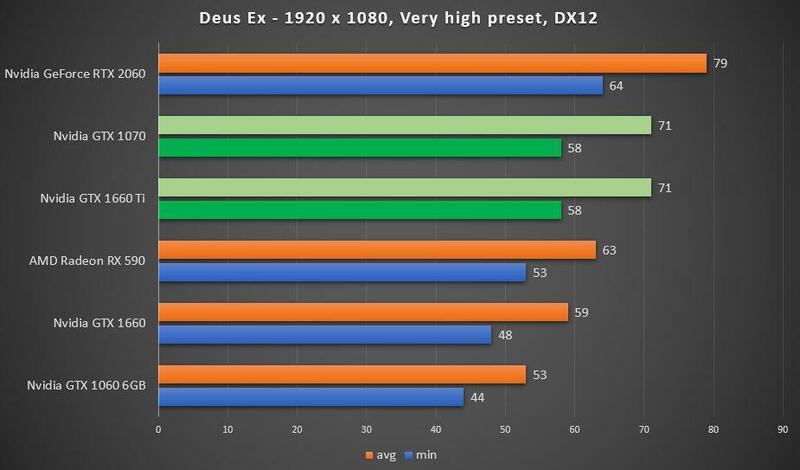 Here, the GTX 1070 performed very well against the GTX 1660 Ti, churning out much higher frame rates, which weren’t far behind the RTX 2060. Not new but still tough to run, Deus Ex is still a great benchmark, but we’re back to slim pickings with near identical results. The GTX 1660 Ti is definitely the one to go for here, though, being the newer card. 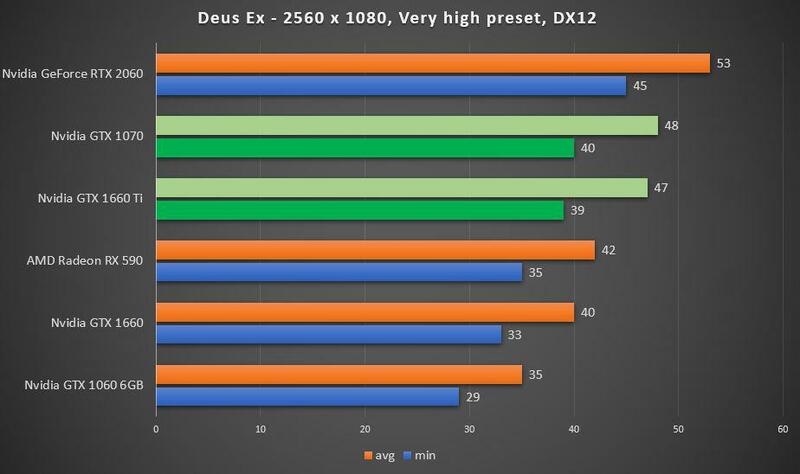 There’s one other factor to consider in areas where performance is close between these two cards and that’s using Nvidia’s new DXR driver to enable Ray Tracing. The Turing architecture is much better at this than Pascal with the GTX 1660 Ti performing similarly to the GTX 1080, albeit performance is still lackluster compared to the RTX series. 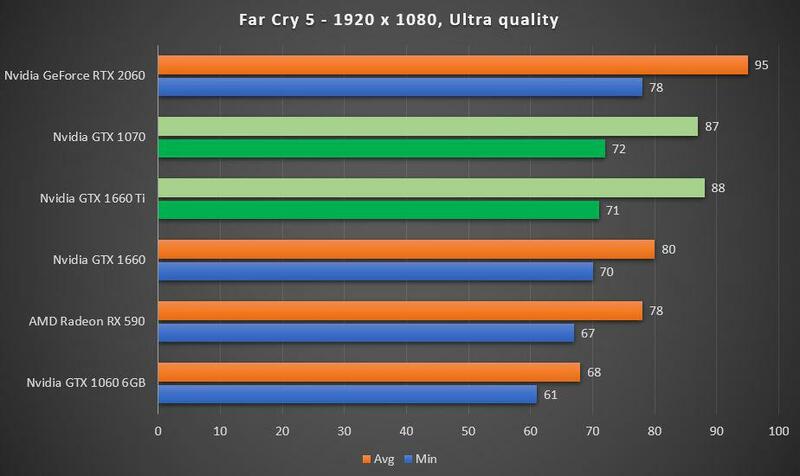 In the benchmarks above, though, overall the GTX 1660 Ti is the winner. It’s as fast or faster than the GTX 1070 in the majority of tests, plus this highly efficient card is often more compact, quieter and more power efficient too. That’s not to discount the GTX 1070 entirely, though, as there may well be bargains to be had as this old card is cleared from shelves. However, it would have to be significantly cheaper than the RTX 1660 Ti for it to be worth buying. Nvidia’s GeForce GTX 1070 has been the powerhouse of mainstream graphics cards, saving us a wad of cash compared to the GTX 1080 and GTX 1080 Ti, but still able to handle games at maximum detail with silky smooth frame rates at 2,560 x 1,440 and on occasions 4K as well. It’s been popular with high refresh rate monitor owners too and is still available, but with Nvidia’s new Turing-based GPUs now asserting their authority, is it time for the mid-range king to bow out gracefully? Armed soldiers on Sunday have invaded the Daily Trust headquarters in Jabi area of Abuja, taking away computers, laptops and other properties from the newsroom. Kenyan teenager Some cares for Diji, whose mother was killed by poachers when he was two years old.This video has been optimised for mobile viewing on the BBC News app. The BBC News app is available from the Apple App Store for iPhone and Google Play Store for Android. 2019 We2Read | Eggnews by Theme Egg.